Summertime may be travel time, but for the biggest fish you should visit Norway in the winter, when there is more space for you and less fighting with others for the best fishing spots. Thanks to the Gulf Stream and warm air currents, the coastal areas and fjords remain virtually ice-free even in winter, and the waters are brimming with big fish that are just waiting for something to bite into. 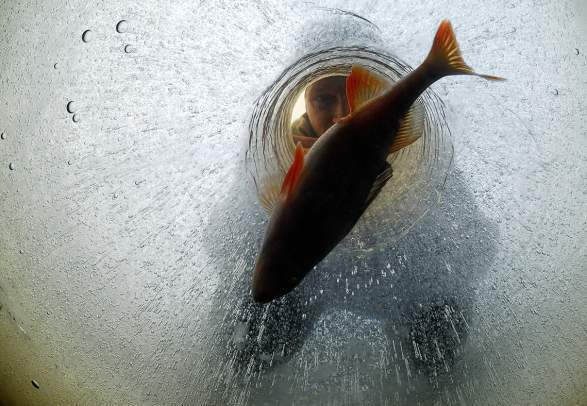 Ice fishing is one of the most popular winter activities in Norway, a country dotted with thousands of lakes. Every year, enthusiasts of all ages bring their fishing rods and set off to find their own lake full of trout or char. At the end of a cold but eventful day outdoors, it is common to wind down in a steaming sauna or snuggle up in front of an open fire. To increase your chances of maximising your catch, consider hiring an experienced local guide or professional fisherman. It is also safer if you want to venture far into the unknown. Apart from the obvious advantages when it comes to fishing, winters in Norway also mean good chances of spotting whales and experience spectacular natural phenomena like the northern lights. You can also take part in a king crab fishing expedition or go skiing, snowmobiling and dog sledding. Check out the seasonal fishing and accommodation offers in the map below, many of which offer private boat hire, equipment and fish-cleaning facilities at good rates outside the summer season. Norway connoisseurs already know that there are plenty of fishing and outdoor adventures on offer in March and April in the fjords and by the coast. Especially in the central and northern parts of Norway you can experience true fishing magic, as the coast fills up with spawning cod. If you dream about catching a real whopper of a fish for once, this is the time to try. Southern Norway also has excellent fishing possibilities in the spring – especially for everyone who enjoys looking for cod, ling and sea trout in the fjords or the sea. It is very rare that fishing tourists return from a fishing excursion empty handed. The Norwegian spring weather is usually fairly mild, stable and dry. In many regions of Norway, the months of March, April and May are even the driest of the year. Since the direct distance between the southernmost and northernmost point of Norway is almost 1,700 kilometres, the weather varies a great deal in different parts of the country. The autumn months of September and October are also great for a fishing holiday in Norway, because at this time the water is teeming with all the saltwater fish species you may wish for. Even summer guests like mackerel and hake hang around in some places well into October. In Central and Northern Norway, the autumn months offer good chances of catching giant saithe and halibut. In the middle of Norway and down south you have ample chances of catching some handsome ling. Quiet, sunny autumn weather with double digit temperatures is not rare – the phenomenon called Indian summer can indeed be experienced sometimes in Norway, both in the south and in the north. In the north and at high altitudes, the first snow usually falls sometime in October. In many parts of Norway winter does not start until November. The change from autumn to winter lasts for a few weeks in the south and the middle of the country, whereas this transition often takes only a few days in the north. The transformation from the warm and sparkling colours in the autumn to a magic winter wonderland is bound to make a long-lasting impression on visitors to the area.